Lou Lou and Ted met in 2011 under the most unique of circumstances. A group of Ted’s friends were getting together to go to Ladies Day at Aintree and Lou Lou had been invited along by her friend. The two crossed paths when they both ended up staying the weekend together in Yorkshire at Ted’s house! After a fun weekend, the pair began seeing each other long distance until Lou Lou, then living in London, decided to take the plunge and move north to Yorkshire in May of 2014. On December 22, 2014 Ted proposed in Lou Lou’s grandparents home, her most favourite place in the world. 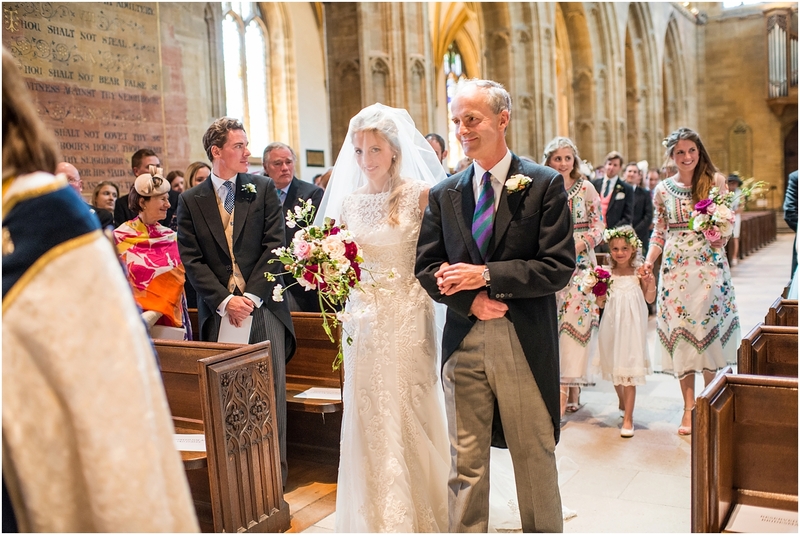 The ceremony took place at Sherborne Abbey where Lou Lou had been confirmed many years earlier. 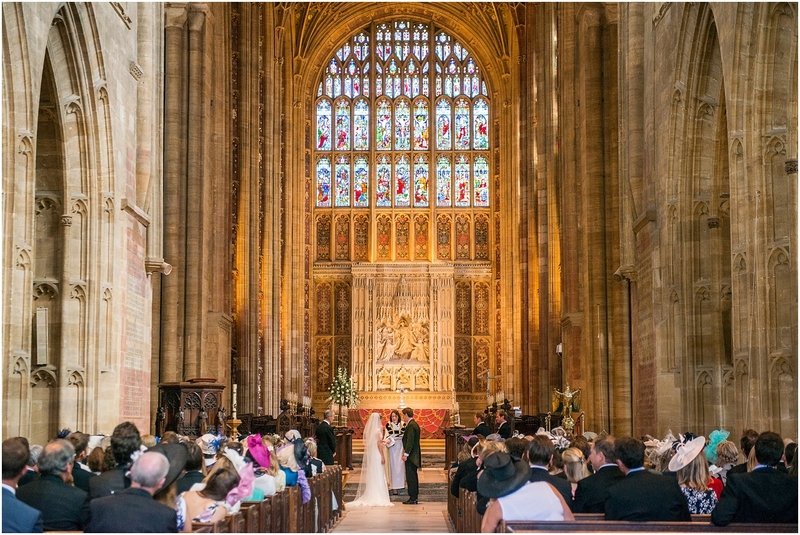 Originally erected in 705 AD as a Saxon cathedral, the abbey has a rich history and beautiful interior. Escorted by her dad, Lou Lou made quite an entrance and clearly took Ted’s breath away. 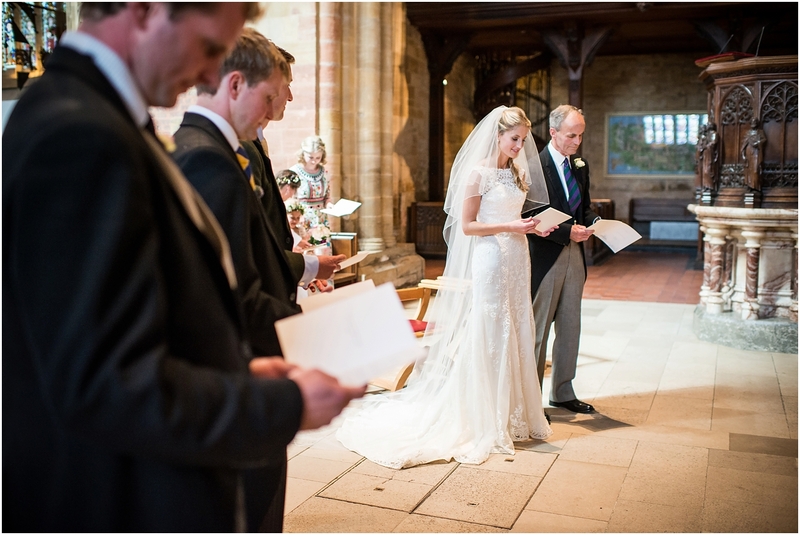 Instead of writing their own vows, they chose a prayer that closely reflected their love and devotion. Lou Lou’s younger sister brought the crowd to tears with her rendition of “How Great Thou Art” – they were both so touched by her lovely voice. 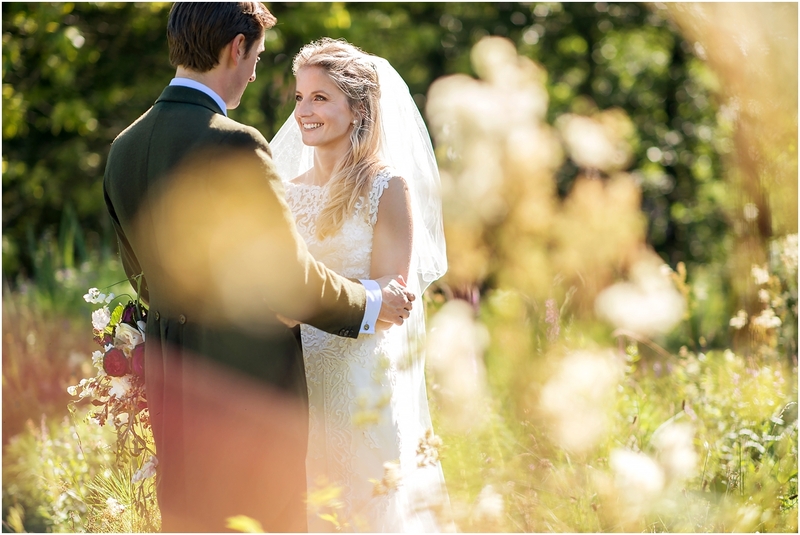 When they started planning the wedding, one thing was certain – they wanted a day that most reflected who they are, relaxed and thoughtful. They decided on Lou Lou’s parents home in the countryside of Batcombe Dorset. The rolling hills were a picturesque backdrop to create the fun summer party they had envisioned. Lou Lou’s sister, an amazingly talented florist, transformed the marquee into an elegantly lit space adorned with delicate greenery accented by clusters of yellow and red berries. During the reception and there after, guests mingled in the garden under the warmth of the August sun. The weather was just stunning and the marque was both beautiful and had a cozy inviting feeling. Exactly as they had envisioned. The party under the marquee was a memorable one. The feeling was reminiscent of a mid summers night dream. 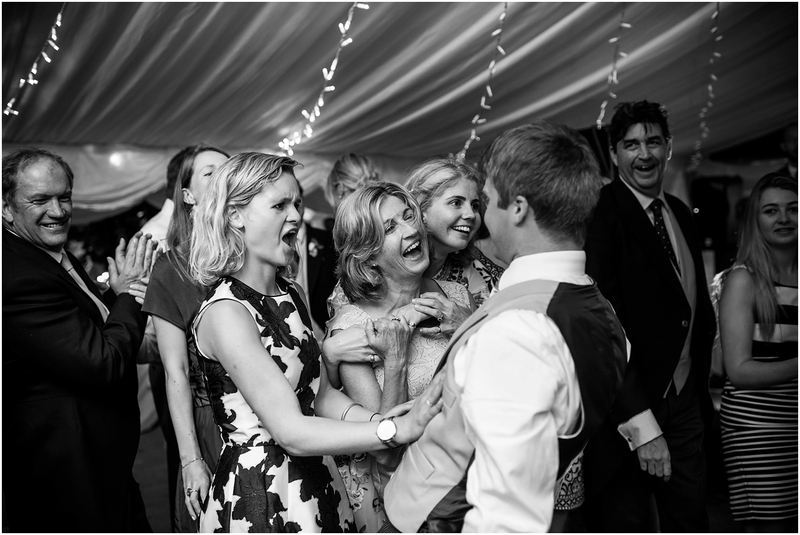 The first dance was “Great Balls of Fire” uncharacteristically chosen and in which Ted produced some of his signature dance moves. Guests adorned themselves with comical wigs and masks that made for some really fun photo opportunities. Despite Ted’s aversion to a camera, I was able to capture the light and love between the two of them, which made for some sweet moments they can look back on for years to come. I had such a lovely time working with Lou Lou and Ted and look forward to also capturing Lou Lou’s brother, Jamie and Sophie’s wedding, this coming April. Jamie lead the couple out of the abbey whilst playing the bagpipes after the ceremony which really added to the atmosphere. And finally – advice for other couples? 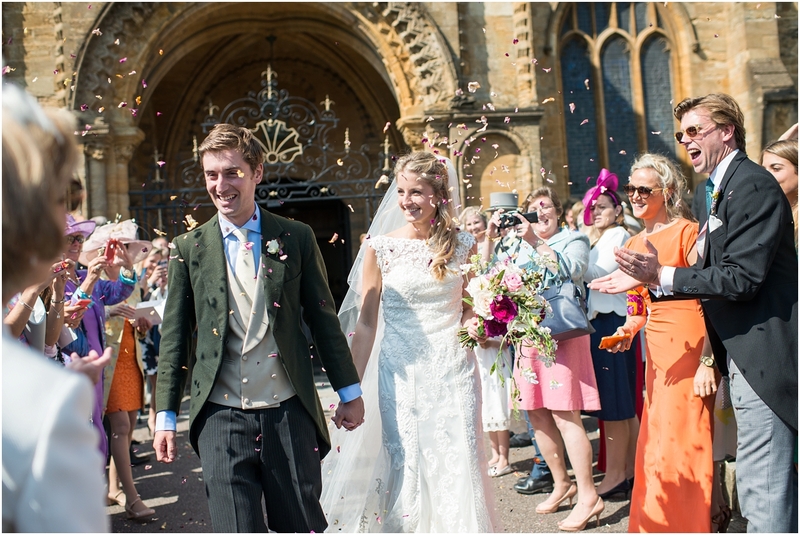 Make sure the wedding reflects who you are as a couple and don’t stress or overly panic about the planning. Everything will come together over time – just be patient.